This is a rare opportunity to own a classic Midnight Lace 52 in excellent condition. The yacht's second (current) owner has kept her continuously upgraded and meticulously maintained since his acquisition in 1998. She was repowered in 2003 with Cat 3126 Bs and new ZF gears. She has had the Cat after cooler upgrade in 2013. She has also had a Northern Lights 9Kw genset installed in 2006. At 26 knots the fuel consumption is 40 GPH., at 22 Knots the consumption is 25 GPH., at 7 Knots the consumption is 8 GPH. Generator burn is a little over 1 GPH.She has spent all but about 18 months of her life under cover and it shows. She is loaded with up to date decor and equipment and is "turn key" ready to go. Engines just serviced by local Cat dealer 10/'16. She is most likely the nicest one available. Over $750,000 invested. 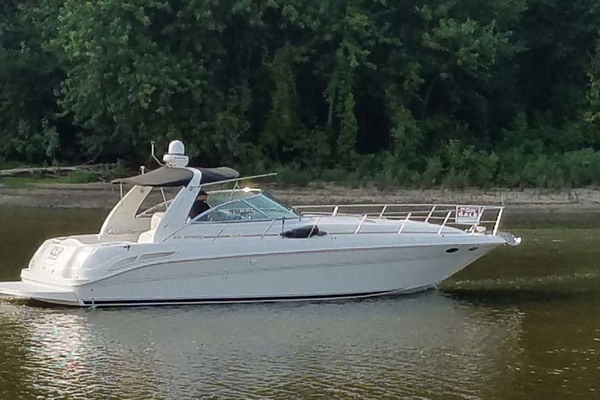 United Yacht Sales New Jersey would love to guide you through a personal showing of this 52' Cheoy Lee Midnight Lace 52 1986. 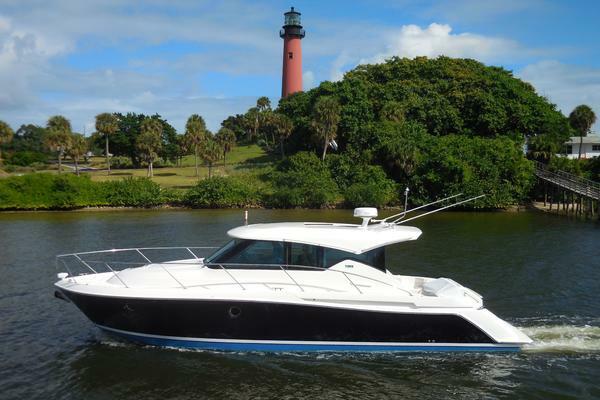 This yacht for sale is located in Tampa, Florida and priced at $195,000. For a showing please contact us by filling out the form on this page and we will get back to you shortly! Beginning first forward in front of the bow cockpit is the anchor rode locker accessed by a hinged door. Next aft is the bow cockpit. This area can be used as a unique seating area and for line and anchor handling. There is a hatch down into the master stateroom so the area can be reached by walking up the quarter decks or through from the inside. At anchor with the hatch open the breeze is captured and blows through the vessel making it very cool and great for sleeping without the air conditioning on. Next aft is the master stateroom with a double berth diagonal to port, storage forward and to stbd., and a vanity with hinge out stool to stbd.. There is a flat screen TV to stbd. forward with its own dedicatedsatellite receiver. There is a companionway to aft on the stbd. side. The master head is to port aft of the master stateroom and across from the guest stateroom. The master head has a tub/shower aft in the compartment and marble counter top. The guest stateroom has upper/lower bunks outboard with storage forward. There are felt lined drawers for storage throughout. There are ample opening deck hatches with aluminum framed smoked lexan lights to let in light and air. Aft of the guest stateroom is the guest head with a diverter type shower with curtain, a Teak grating for drainage, and a marble counter top. To port aft across from the guest head is the galley open up to the salon. The galley has a high gloss finished Teak deck. The staterooms, companionway, and salon have wall to wall carpeting. Galley and salon counter tops are custom black granite. In the salon to port forward is a bar counter open down to the galley. The bar counter is finished in high gloss violin maker's burl veneer. The salon has a large flat screen TV to stbd. forward which can be used to view satellite TV from its own dedicated receiver, broadcast TV, cable TV, and the on board computer for internet etc.. The salon also has a convertible sofa aft that forms another double berth. Under the salon sole is storage for spare propellers (included), tankage, and other systems. Next aft is the aft deck with the engines under hinged hatches. The engine compartments are roomy because the technical equipment has been distributed between under the salon, the engine compartments, and the aft generator compartment. Next aft under the curved aft deck settee is the generator compartment accessible through hatches in the settee top. The placement of the generator here makes it very quiet being segregated so far from the accommodation spaces. There is a short ladder up to the flybridge control station which is fully enclosed and covered from the sun. The interior is in excellent condition. Fly Bridge version with Stainless steel “Soft- Hard Top” with Vinyl top & Curtains – Eisenglass windows. Fiberglass hull with Airex core reinforced at stress points. Cast marine bronze thru hulls and rudder shaft ports (2003). Exterior gelcoat finish repainted with Imron in 2008. Nonskid molded fiberglass foredeck and side decks. Opening windows in main saloon. Non integral fiberglass molded water and fuel tanks. Teak transom affixed over fiberglass. Forward cockpit with windshield, teak trim & cushions. Epoxy barrier coat (5 coats) on hull with Micron 66 bottom paint. Prop Speed paint on wheels and shafts. Twin Caterpillar 3126B, 450 hp turbo diesel electronic engines (2003), with modified After coolers installed 2/2013. All maintenance/repairs/upgrades preformed by Caterpillar. Re-power done in consultation with Tom Fexas. Caterpillar electronic engine/transmission display panels with diagnostic and alarm system. Cast marine bronze cutlass bearings (2011). Hardened stainless steel shafts 3⁄4” (2003) with cutters. Four blade props (2003) w/spares. 9KW Northern Lights Generator.Model#: M773LW2.3 (2006). Prygon (computer safe agent) Fire suppression system in engineroom and generator room (2014). Bennett hydraulic controlled trim tabs. Mathers (ZF) electronic throttle and shiftcontrol. Oil change pump for engines and generator. Racor fuel filter and separator systemeach engine and generator. Fuel tank cross feeds transfer system. Engine room insulation and 12v lightingwith 120v access. Welded and reinforced aluminum engine bed rails (2003). 120 VAC/12VDC panel with volt and ammeters. 12V battery isolator and anti galvanic(galvanic isolators) system. Engine driven 12V 105A alternators (2). Two 8D and two Group 27 MasterVolt AGM’s (new 1/'17). Cantalupi overhead lighting fixtures (Gold). 12V Marine blowers for heads and galley. 5 Bilge pumps with high water alarms. Marinco 50’ 125/250V 50 AMP power cord and 2 x Marinco 25’ 120 V 30 AMP power cords. Power Cord Y Adapter 30A – 50A/250M. Reverse Power Cord Adapter 50A/250 – 30A. Marine Aire air conditioning system throughout with digital control panels (2 compressors). High speed fly bridge air handler. Charles Battery Charger (smart) 4 Bank 60 Amp. (1/13). 400 Gallon fuel tank capacity with digital gauges. 200 Gallon water tank capacity with digital gauges. Sureflo fresh water pump w/cartridge filter. Raritan 20 gallon 120V water heater. 12V electric fresh water head systems (2). 40 gallon holding tank with 2/Y-valves. 12V macerator waste discharge pump for HT. Deck fitting for waste pump out. Whale sump box w/ sump pump for tub/showers & AC condensation. Custom carpeting, window shades and drapery. Leather couch convertible to double bed (custom). Ultra suede/ teak chairs (2). Teak bulkheads (excellent condition no water damage)..
Tinted (9/12), safety opening glass windows. Books shelves and concealed storage. Exotic wood (violin burl) counter top. Entertainment center w/ am/fm/cd stereo w/ disk changer. Built in Panasonic 32” flat screen TV wired for antenna – cable – satellite & computer. Dell Latitude computer (laptop) (2012). KVH Satellite TV system with two boxes (M 1) (2009)-Direct TV. Varnished teak & holly sole. Wiring & space for dishwasher. Wiring for washer & dryer. Teak pantry storage with shelving. Ample drawers & storage cabinets. Pots-pans, dishes, utensils, glasses, cups convey. Auto light hanging lockers (2). Marble vanity with mirror and ultra suede swing out seat. Sharp 13” TV wired for cable/antenna/satellite (w/ dedicated sat. receiever). Storage locker access hatches to lazarette storage area (generator). Ladder to fly bridge (teak steps). Storage locker for fenders,dock lines, etc.. Hydraulic mast lift (17’ down to 24’ up) (3500 psi hydraulic power unit 12V DC) (2013). Custom stainless steel anchor pulpit. Stainless steel port side deck fills for fuel, water, and holding tank. Teak & stainless steel rubrail. LED running lights & anchor light (Hella). Forward cockpit with custom cushions (Sunbrella). Teak trimmed navigation table with cabinets below. Teak destroyer style command wheel. Stidd adjustable cushioned helm chairs (2) (2006). Caterpillar digital electronicengine &transmission datainstrumentation & diagnostics. Dedicated fuse panel for electronics under dash. Approx. 45# CQR type anchor (polished). 60’ anchor chain spliced to 150’ line. Fortress 37 anchor with 150’ tape on reel (backup). Electric 120v high capacity emergency pump (portable). Pryogen (computer safe gas) fire suppression system for engine room & generator room (lazaret). SARSAT 406mz EPIRB (with GPS). Avon Redcrest 9’ inflatable dingy with oars and motor bracket (never been used). Kahlenberg trumpet air horns (2) Chrome. High powered floodlight on mast. Raymarine E120 12” Multi function chart plotter display. Raymarine RS 125 GPS sensor (2). Raymarine S2G Core pack & Gyro. Raymarine Auto Pilot (just updated 5/17). SR100 Sirius Weather receiver (Sirius Weather). Raymarine RAY240 Fixed Mount VHF Radio. Raymarine I70 Depth ,speed, wind direction and speed (6/2016). Clarion M475 AM/FM Sirius radio- stereo w/4 speakers. Dedicated fuse breaker panel for electronics under dash.